This work is sold with a photo-certificate from Jacques Dupin dated 9 février 99. 'Album 19 is the result of a close collaboration between Miró and Raymond Queneau. Queneau wrote his text on viewing the lithographs and Miró then decorated the manuscript. 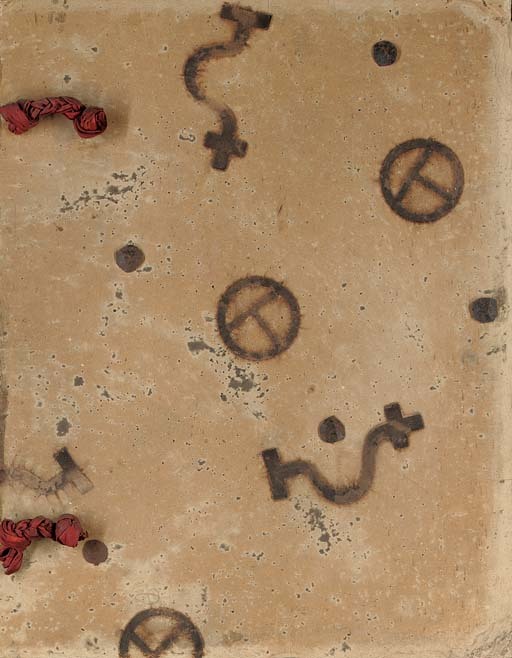 The model for the casing was created by Miró with old cardboard boxes corrugated by the rain and the sun. These boxes were then burnt with irons for branding bulls. The inside is made of wrinkled wrapping paper.